President Barack Hussein Obama … Lost in Smallness. How fitting that Obama goes to Comedy Central to appear on The Daily Show as he has been nothing more than a joke. Less than two weeks before the 2010 midterm elections, Democrats in a free fall pre-election panic, an economy in the tank, unemployment near 10%, record number of individuals are on food stamps, record housing foreclosures, 14.8 million people out of work and record federal deficits so what does Barack Obama do … heads off to Jon Stewart’s ‘The Daily Show’ to tape an appearance to be aired on October 27. President Barack Obama is taking his campaign message to “The Daily Show” with Jon Stewart. White House spokesman Dan Pfeiffer says Obama is taping an appearance on Oct. 27, just days before the Nov. 2 elections. Stewart is coming to Washington next week for the “Rally to Restore Sanity” he is holding three days later on Saturday, Oct. 30, on the National Mall. Could this President get any more “small”? Could a President of the United States of America act in a manner that is more beneath the office? 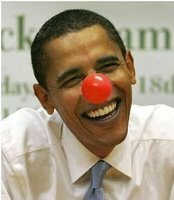 A country in crisis and Obama is off to “yuk it up”and act all Presidential at Comedy Central. How fitting America from the Comic in Chief … the jokes on you. 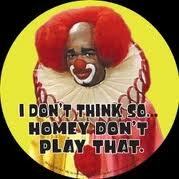 How I liked this clown so much better! The past two years of the Obama Administration has been nothing more than one bad, long SNL skit. However, don’t worry America, Obama takes his job seriously, it is not as if he is going golfing. it must scare obammy pretty bad to know that slim shady clinton is more popular than he is right now. rejection will send obammy scrambling to the nearest corner whining and sucking his thumb. No President should EVER go on the Daily Show; an alleged comedy show by the liberal nut job Jon Stewart. Nor should any President EVER go on The View; do March Madness picks on ESPN or make regular appearances on Leno and Letterman. He does not act like a President should. He’s is consumed with himself and in more ways than not is just a bad reality show! He wants to reach the audience/voter most likely not to have paid income taxes or had a career. #2, Scott, Yep, I could not agree with you more. Have posted several times on obama’s lack of dignity and respect for the office. I can only hope in a couple of weeks, America’s voters make a point loud and clear. For a guy who supposedly is such a great speaker, I found it very disappointing after listening to him for the very brief time I could stand it, that anybody could be whipped into a frenzy to vote for him. He has nothing to back up his rhetoric. I guess it was “trendy” to vote for him back then. most of oblamey’s white support were those yuppies who thought it would be cool and make them popular amongst their black friends if they voted for obama. as you can see, they are running for their lives from oblamey. even his own fellow politicians distance themselves from him. but , don’t be fooled by this. this is just to try and get them elected then they will be right back kissing up to him. Bill White is a perfect example. he’s gonna move into a double wide if elected ? some double wides cost more than houses Bill. maybe you should opt for a single wide built in the 70′s. it would make you a little more believeable.